Remove engine room cover. Refer to EM-46, "Exploded View". Remove air cleaner body. Refer to EM-25, "Exploded View". 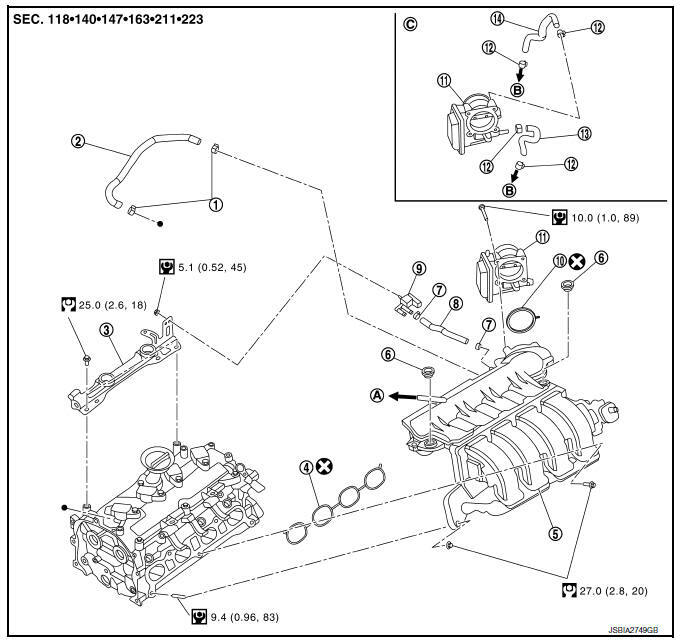 Disconnect the radiator hose (upper) from the water outlet. Refer to CO-15, "Exploded View". Remove electric throttle control actuator. Handle carefully to avoid any shock to electric throttle control actuator. Pull out oil level gauge. Cover the oil level gauge guide openings to avoid entry of foreign materials. Disconnect vacuum hose and EVAP hose from intake manifold. Disconnect PCV hose from intake manifold. Disconnect harness connectors from the runner control valve, runner control valve position sensor, and the tuning valve. 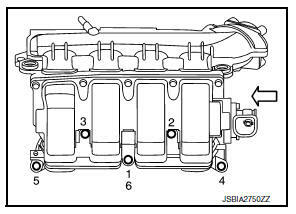 Loosen intake manifold nuts and bolts in the reverse order as shown. Disregard the numerical order No.6 in removal. Remove intake manifold and intake manifold gasket. Securely install intake manifold gasket to the mounting groove of the intake manifold. Do not reuse intake manifold gasket. Tighten intake manifold nuts and bolts in the numerical order as shown. Tighten No. 1 bolt again. Tighten bolts of electric throttle control actuator equally and diagonally in several steps. 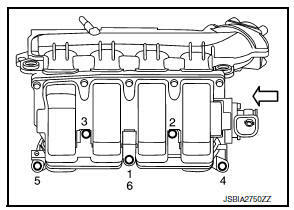 Perform вЂњThrottle Valve Closed Position LearningвЂќ after repair when removing harness connector of the electric throttle control actuator. Refer to EC-139, "Description". Perform вЂњIdle Air Volume LearningвЂќ after repair when replacing electric throttle control actuator. Refer to EC- 140, "Description". Check for engine oil leaks and engine coolant leaks with engine at operating temperature and running at idle. Do not touch engine immediately after stopping as engine is extremely hot.